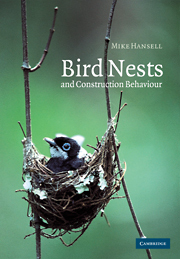 Bird Nests and Construction Behaviour provides a broad view of our current understanding of the biology of the nests, bowers, and tools made by birds. It illustrates how birds, among vertebrates, have more impressive and consistent building abilities than any other builders, excluding humans. However, birds seem to require no special building equipment and use quite uncomplicated behavior. The book raises general issues in the field of behavioral ecology, including the costs of reproduction, sexual selection, and the organization and complexity of behavior. This volume was written for students and researchers of animal behavior, behavioral ecology, and ornithology, it will nevertheless make fascinating reading for architects and engineers interested in understanding how structures are created by animals. 1. Animal builders and the importance of bird nests; 2. The clutch-nest relationship; 3. Standardising the nest description; 4. Construction; 5. The structure; 6. The cost of nest building; 7. The selection of a nest site; 8. Bowers, building quality and mate assessment; 9. The evolution of nest building; Bibliography; Index.